As a high school junior in Corona, Christina Rodriguez applied to four University of California campuses and Princeton University. 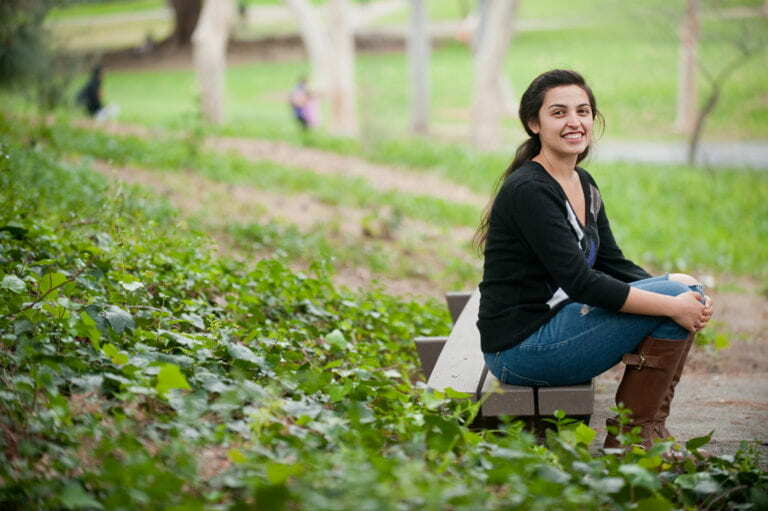 She was accepted into all of them, but her choice was clear: UC Irvine. The selection was partly inspired by the fact that she’d spent some of her childhood living in Arroyo Vista housing with her mother, then a social ecology undergraduate, and three siblings. From second to fifth grade, the campus was her playground. But what made Rodriguez stay at UCI and what convinced her that she’d made the best decision for her personal life and academic career was her participation in the Summer Bridge program prior to her freshman year. Summer Bridge is a free, six-week academic and residential program offered through the Division of Undergraduate Education. The curriculum is designed to help first-generation, low-income or disabled students make a successful transition to UC Irvine. Participants earn UCI credit and get a head start toward their degree while meeting other newcomers, faculty and staff. They take courses in university studies and the logic & philosophy of science taught mainly by senior-level graduate students in social ecology and sociology. 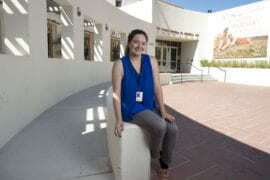 Although Summer Bridge serves those who are, statistically, more likely to drop out of college, the four-year graduation rate for participants has been steadily increasing and coming closer to the campus’s overall freshman four-year graduation rate, says Natalie Schonfeld, until recently the director of student transition services. The most recent cohort for which data is available had a four-year graduation rate only 0.4 percent below that of the entire graduating class. Three years earlier, the discrepancy was nearly 30 percent. Rodriguez has a full academic and social life on campus. She’s majoring in English, with a minor in global sustainability, and is taking prerequisite courses for medical school. She’s also learning salsa dancing and participates in a program at a local hospital that allows her to shadow a doctor performing robotic surgery. This summer, she’s headed to Iceland, where she’ll study sustainable technology and resource management. “I’m really most excited about taking expeditions to volcanos,” Rodriguez says, laughing. She credits her humanities courses with strengthening her public speaking and presentation skills, as well as her writing, and thanks Schonfeld for helping her cultivate other skills that have been crucial to her success in college. Schonfeld, who became executive director of the Academic Senate in early February, taught a course in the Summer Bridge program and had the tough job of annually vetting more than 800 applicants for 87 spots. 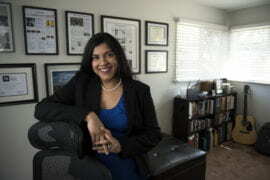 For example, Rodriguez recalls that her Inland Empire high school was visited by only two college representatives during the application season. Both were from private, for-profit institutions with less-than-stellar reputations. The DUE organizes quarterly “reunion” events at which onetime Summer Bridge students receive information about academic support services and programs such as study abroad.